Robert Burns will become the first person outside of the Royal Family to be celebrated with three collections of stamps when a new edition is unveiled this week. 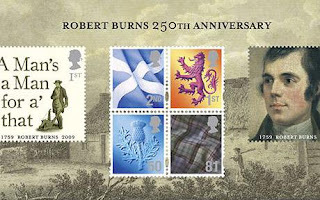 The Royal Mail is to issue the new collection, featuring two stamps with Burns designs and four with a Scottish theme, to mark the 250th anniversary of the poet's birth. The head of special stamps at Royal Mail said that despite his early death aged 27, Burns' poetry has secured him a place in history and continued that they were delighted to celebrate the 250th anniversary of the birth with this special commemorative sheet. The two first class stamps will be published on Thursday, one featuring a portrait of the bard and another bearing the words of one of his most famous songs, A Man's A Man For A' That. The other four stamps feature a saltire, a thistle, a lion rampant and a tartan cloth. A Robert Burns commemorative £2 coin, produced in association with the Royal Mint, will also be on sale. The poet was previously celebrated with stamp issues in 1966 and 1996, the latter to commemorate the 200th anniversary of his death. There are a host of events taking place throughout Scotland to mark the birth under the banner of Homecoming 2009 celebrations 2009. Ian McCaig organiser of a series of Scottish Golf events has welcomed the publication of the stamp. "We'll buy in sheets of them to make sure that we have enough to send out in all our Homecoming Golf Classics 2009 mailshots! Every little bit helps!" The headline caught the eye "Sunday golf ban could cost island course £75,000 grant" followed by the problems being outlined relating to The Isle of Harris golf course's application for £75,000 of public money. Apparently the application may be rejected because the club is closed every Sunday on religious grounds in line with other public facilities on the island and neighbouring Lewis. It appears that the national sports agency, SportScotland, says giving taxpayers' money to the organisation could contravene equality legislation because of its refusal to open on the Sabbath. According to The Scotsman, Louise Martin, who chairs the body, said: "SportScotland is mindful of the views and traditions held by many in parts of the Western Isles regarding the opening of sports facilities on Sundays. However, SportScotland also has responsibilities under the 2006 equality legislation to ensure that anything it funds is accessible to all, wherever possible, regardless of gender, race, disability, age, religion or belief …"
Now this may or may not be a real issue rather than one which the journalist sees an angle on but I have not heard any major threats being applied to a rather more famous golf course that closes on Sundays for other traditional reasons. Surely all the golf club need to do is suggest that it needs to close on Sundays in order to rest the course? This is not about getting into any arguments about religious observance or even the tourism benefits of being open and available for play it is just about recognising that there is perhaps precedence for receiving public funds and not being open seven days a week. The money sought from sportscotland represents half the £155,000 cost of improvements to drainage, storage and the clubhouse and the other parterns involved Highland and Islands Enterprise and Western Isles Council, the other funders, are not insisting on seven-day opening. Some common sense surely from SportScotland? "The Scottish Government announced organisational changes to The Tourism Unit on Friday. The Tourism Unit, including responsibility for Homecoming, will transfer from David Wilson's Enterprise, Energy and Tourism Directorate to Leslie Evans' Europe, External Affairs and Culture Directorate. David's Directorate will be renamed Enterprise and Energy Directorate. The Tourism Unit will join the newly named Promotion of Scotland and Tourism Division headed by Vicky Carlin at Deputy Director level." Now can anyone advise what it means to tourism? What does the Nominet Annual Report 2008 mean for your business? Nominet published it's annual domain name industry report recently and whilst the majority covers domain name statistics and the UK registrar market it does include some interesting research on trust and awareness of UK domain names. This provides some important guidance for businesses to consider as part of their online strategy. For example, using Social Networking to further your online presence is especially valuable to those businesses with a high proportion of female customers. Those involved in the UK travel and entertainment market should take note that a very high percentage of consumers prefer to use websites on a domain with a .co.uk suffix. This will be especially important in 2009 when it is expected that the current economic situation in the UK will lead to more people holidaying at home. For further information about you domain strategy and how these statitics affect your business please contact Chris Dempsey on 01292 521 404 or email chris@gettheedgeonline.com. The current deterioration of the general economic conditions in the UK combined with increased cost of raw materials and the fall in value of Sterling against the US Dollar, Euro and the Yen have forced print costs to rise recently. For example the cost of some inks went up 13.5% and vinyl 5.5% at the start of 2009 and paper and vinyl costs have been climbing steadily for the past six months or more. Additionaly, fuel surcharge costs applied by several of our suppliers are still in place even though the cost of diesel fell sharply towards the end of 2008. The Edge are committed to maintaining our highly competitive pricing structure and through careful negotiation and strengthened relationships with local printers will ensure that any increse in costs are passed to our clients only where this absolutely cannot be avoided. For further information on the Print and Design services offered by The Edge please contact Steven Timpson by telephone 01292 521 404 or email steven@gettheedgeonline.com.